Date of establishment: Owned by the Amoreau family for more than 400 years. The current château was built in 1832 by Barthelemy Amoreau. Current owner: Jean-Pierre Amoreau and his son, Pascal (the 15th generation), oversee the vineyards and vinification. 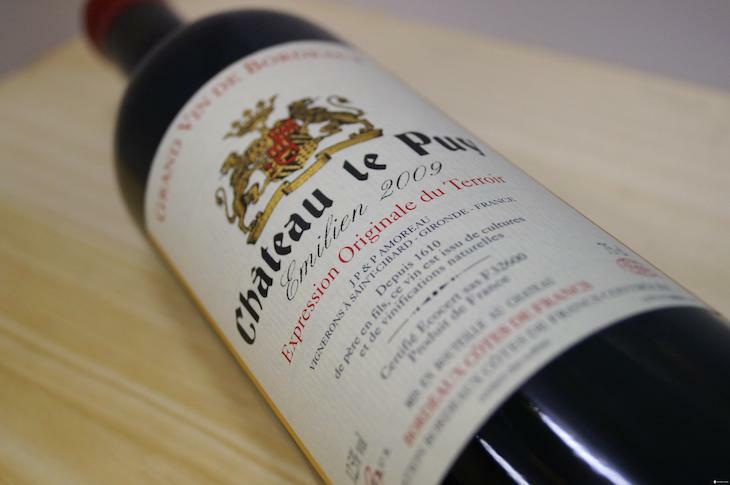 Château Le Puy is a little-known Bordeaux property based in the Francs Côtes de Bordeaux that has been producing delicious, authentic Bordeaux red blends for 400 years. With over 7,000 wineries in Bordeaux, it is easy to get lost among the classified growths of both left and right banks and never venture out much further to explore the great value wines of the Côtes de Bordeaux. Merlot does very well in this region with combinations of clay and limestone and it is not a surprise that Château Le Puy is made up of a large proportion of Merlot. The chateau, proud of its long family ownership and even more proud of their organic farming methods since the beginning of the family’s ownership way before organic wines were fashionable, hosted a tasting in Hong Kong of one hundred years of Chateau Le Puy. This was a remarkable tasting because the wines were in amazing condition. One of the reasons for the freshness in all the bottles was that all the vintages from 1990 to 1917 that were tasted was reconditioned. This means, the selected bottles were opened, tasted and topped up with the wine from the same vintage. This was done one and a half months before the tasting. Thus a Chateau Le Puy older than 1990 purchased years ago and kept in one’s cellar would not have the same tasting profile as the notes provided below. Sweet, luscious, really gorgeous flavors in this ripe vintage. The palate is persistent yet still delicate. Wonderful purity and freshness wraps together sweet, luscious fruit around firm tannins and fresh acidity. It is clearly mature – but beautiful so with complex layers of flavors and a long finish. The color of this 1986 is pale but the flavors are intense and very sweet – filled with vibrant cassis, violets and dried herbs even at 30-plus years old. This is an excellent vintage for Le Puy. A great vintage for this biodynamic property – combining depth, focus and intense ripe tannins that are supple and fine. This will be one of the best vintages for Chateau Le Puy, like the 1982 and the 1986. A delicious, pure 1961 with vigor and energy along with firm, supple tannins and nice length. Complex layers of roasted herbs, firm tannins and dried berries that linger on the palate. A wonderful 1961 still going strong. An elegant 1989 Chateau Le Puy with layers of firm, delicate and supple tannins on the palate. The palate has a gentle expression of tobacco, earth and savory, roasted herbs. Nice intensity, depth and finish. Ready to enjoy now. This is a restrained 2009, quite different from the opulent, overt Bordeaux reds made in this warm, ripe vintage. There is lovely freshness and an earthy character with nice length and good depth of flavors. A lovely mature Chateau Le Puy that is still alive and elegant. The palate offer layers of dried fruit and herbs with a sweet fruit core. Love the sweetness and ethereal, seamless character of this wine. Lovely finish though it is not that long. A wine that was probably even more of a beauty a few decades ago. This is a tannic, quite austere vintage for Le Puy – the fruit is quite backward and while there are spices and roasted herbs coming through on the nose, the palate is quite chunky. However, the wine shows good potential to evolve and develope and will benefit from at least 5 years more of aging in bottle.